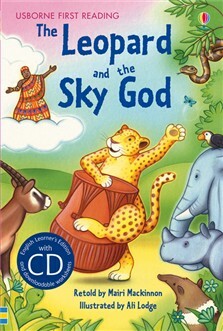 Leopard loves to bang his drum, but when he refuses to share it with the Sky God, he finds himself in a lot of trouble! Based on a West African folktale. Part of the Usborne Reading Programme developed with reading experts at the University of Roehampton. Featuring the colourful illustrations of Katie Lovell. Includes several pages of reading-related puzzles. Also available as an ebook with narration in British English (on tablets that support audio). For every parent, child and teacher weary of the monotony of the average reading scheme, Usborne’s First Reading series will offer rays of sunlight. The books are carefully levelled and offer a huge variety of accessible and fun, fiction and non-fiction.